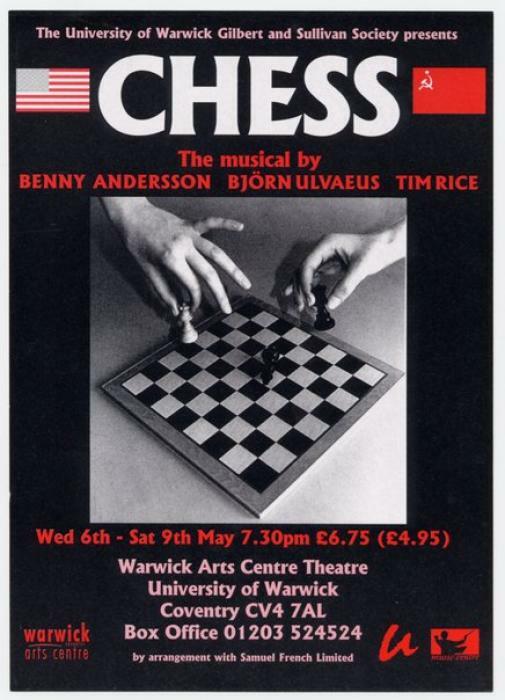 Chess remains the most expensive and ambitious production ever attempted at the University of Warwick, and marked the first production by Music Theatre Warwick (then the Gilbert and Sullivan Society) in the Warwick Arts Centre Theatre in several years. Chess had a cast of 51, an orchestra of 29 and backstage crew of 21; 46 microphones, 7 video monitors, 160 lights, a two level set with 8 moving components, 8 flying components, and over 200 cues. It is almost entirely through-sung and consists of 2 hours 30 minutes of music. The production cost over £6,000, enormous for a student show. However, it played to nearly 1,700 people (86% of capacity), making it still the most attended student show in memory at Warwick and among the Top 5 selling shows at the Warwick Arts Centre of the season.